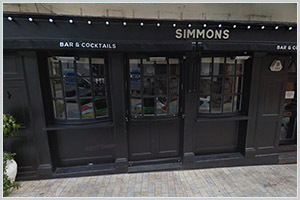 Simmons Bar Temple | Pub Quizzers | Find a pub quiz near you, now. Pub quizzes take place at Simmons Bar Temple, Temple on Mondays (weekly) at 19:30. Entry is £2.00, you can have up to 6 people on a team. There are prizes of cash, drinks. Happy quizzing! Hosted and Written by Compleat Quiz. All winners qualify for monthly Champions Pub Quiz Night. This quiz begins Tuesday 13th February 2018. In football, who was nicknamed 'The Divine Ponytail'?